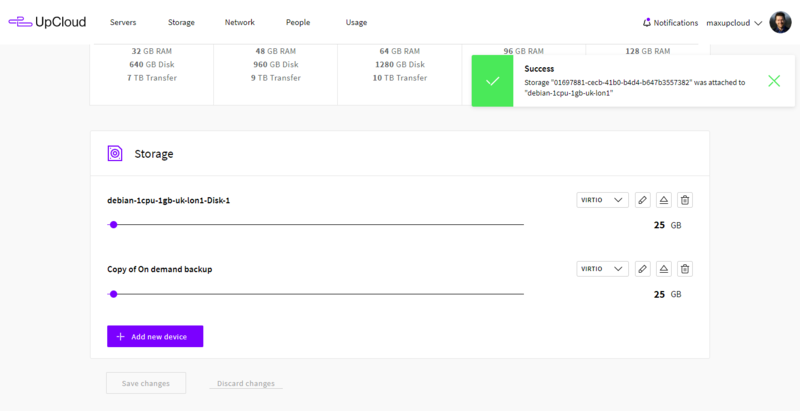 UpCloud provides two ways to restore data from your disk backups. You can either revert the entire disk to a previous backup snapshot, or you can clone the backup to a new storage and restore individual files by mounting the cloned device onto a server. This method will overwrite the existing disk entirely with the selected backup. All data on the disk will be returned to the point at which the backup was taken. This is very useful for reverting major changes to your current system. Note that the cloud server must be shut down during the backup restore procedure. Start by going to your server settings at your UpCloud control panel and open the Backups tab. On the list of All backups, you’ll see the backups stored of your server. On each backup line, you can find the date and time of when the backup was taken and controls to restore or delete the backup. Select the backup you wish to restore, click the Restore button, then confirm by clicking Ok in the pop-up. 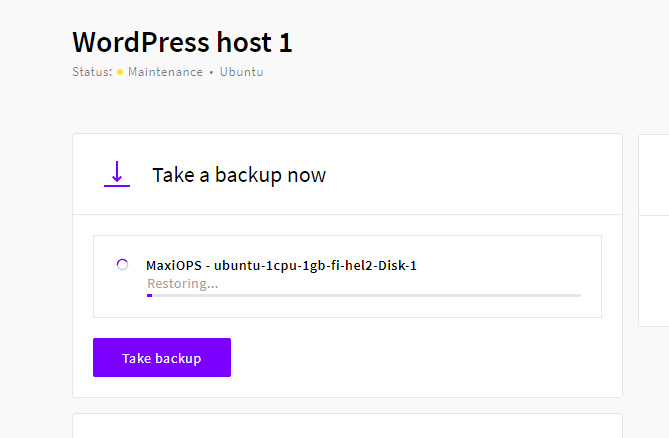 The backup restoration will only take a moment depending on your storage size and type, MaxIOPS is considerably faster at all storage procedures than an HDD of the same size. You can follow the progress on the Backups tab. Once the restore has finished, you can start the server as normal. It is also possible to clone a backup onto a new standard storage device. You can then attach the clone to the original server, or to any other, as a secondary disk. Attaching a backup clone to your existing server allows you to access individual files from the disk without needing to revert the entire system. To start, go to the Backups sections under the Disks tab at your UpCloud control panel. Find the backup you wish to access on the list and click the Clone button. Give the backup clone a name you’ll recognise later and click Accept to proceed. The cloning will take a moment depending on the size of your backup and the disk type you selected as the target. You can check the status at your Storage devices section. While cloning, the cloned storage device will show that the operation is in progress. Once the operation has finished you’ll see the same controls as for the other storage disks listed on the same page. Once the cloning process is complete shut down the server, then go back to your server settings and open the Resize tab. Under attached Storage resources you’ll find the option to manage the storage devices. Note that the cloud server must be shut down before attaching new storage disks. Click on the Add new disk button which will open a new setup dialogue for creating and attaching storage devices. Select to Attach existing, then find the disk clone you made earlier and select it as the Disk source and finally click the Add a storage device button to confirm the action. Afterwards, you’ll see the cloned device shows up as an attached resource, you can now start up the server again. Linux systems will require you to mount the new storage to access the files from the backup clone. Do this by first creating a mounting point to your file system with the following command. Check the device name and partitions you just attached to the server with the command below. The output will show a list of disks usually named like vda, vdb or vdc and their partitions such as vda1 and vdb1. If you are not sure which of the partitions is on the cloned backup, you can check your current system partitions with this command. The command will list the partitions and their sizes currently configured on your server. Select a partition from the lsblk printout that is not yet in use, for example, if your system partition is called vda1, select vdb1 for mounting. Then simply mount the new storage disk partition to the directory you just created with the following command. After mounting the disk you can restore any and all files you wish by simply coping them over. Windows servers might require you to take a couple of steps before you are able to access the backup files. Start by connecting to your server, for example, through Remote Desktop. Once logged on type in diskmgmt.msc to the Windows search and open it by pressing Enter. In the Disk Management, you’ll see the previously existing disks and the newly added backup clone that will likely show as offline. Right-click the clone disk and select Online. Depending on your Windows server version, you might get a pop-up asking to scan the new drive, you can skip this by clicking Continue without scanning. With the disk online, you can now access it normally through the file browser to copy over any files you wish to restore. Once you have restored the files you needed, it is as simple as shutting down the server again, detaching the backup clone and deleting it. Go back to your server settings again and open the Resize tab. Under attached Storage resources list you’ll find the option to detach or delete. If you do not wish to delete the backup clone just yet, you can simply click the eject icon and leave the disk for later use. Otherwise, you can just click the bin icon and the disk will get detached and deleted. Don’t forget to make regular backups of your server again after restoring files. The steps required to restore and access files in backups might seem complicated, but we aim to make the process as simple as possible. The backup technology focuses on data integrity while being fast and easy to operate. However, it comes with a couple of main differences to some other backup models. We handle storage disks and their backups as full media images. Access to individual files would require knowledge of used partitioning, file system and possible disk encryption, which would reduce your data privacy. Due to this, it is not possible for us to either restore backups for you or provide a graphical user interface to access or browse contents of the backups. Backups are stored in separate storage systems which maximize storage capability over IO and access properties. Due to these limitations, it is not possible to directly attach backup as a disk. Instead, a new standard storage can be created by cloning the backup. Note that cloning is usually possible only to the same storage tier as the original disk image was from.